Selecting AWS meant we did not have to create our own content delivery network, cache server, domain name server, or other systems. We could use the AWS services on demand and pay based on our actual usage. This allows us to dedicate more resources to application development and customer service. Headquartered in Taiwan, Unalis entered the gaming industry in 1993 and expanded from PC and online games to mobile games in 2011. Unalis now provides mobile gaming content and applications, as well as gaming analytics for developers. Unalis also uses social media to deliver technical information, videos, illustrations, and e-commerce services to Chinese-speaking markets in Asia. The business also publishes games created by overseas developers. Unalis also wanted to shorten its development cycles to bring new games to market more quickly while controlling infrastructure costs and focusing its technology team on projects that deliver value to the business. In addition, the infrastructure needed to be reliable and provide rapid response times to minimize disruption to mobile gamers’ activities. Finally, Unalis needed an infrastructure that could cost-effectively capture, store, and process large volumes of gamers’ data for analysis by the company’s mobile analytics platform, UniCloud. The platform currently captures about 200 megabytes of raw data from users in different countries daily. Information on user behavior, game operations, and strategic planning insights are provided to developers, enabling them to predict market factors and forecast their marketing budget. Unalis wanted to migrate UniCloud, its social media service, and existing mobile games to—and develop new games in—a scalable, elastic, and agile cloud service. It reviewed cloud services in Asia and found that Amazon Web Services (AWS) was the most cost-effective and provided the widest range of features. The company decided on AWS in 2012. “Selecting AWS meant we did not have to create our own content delivery network, cache server, domain name server, or other systems. We could use the AWS services on demand and pay based on our actual usage. This allows us to dedicate more resources to application development and customer service,” says Chou. Unalis also found that AWS was stable, easy to use, and simple to maintain. The company moved its games, systems, and social media service across to AWS regions in Singapore and Tokyo over the course of a year, moving individual games across in projects taking up to three months. The company also spent six months refining its AWS architecture to meet its requirements. For its mobile games, Unalis uses Amazon Elastic Compute Cloud (Amazon EC2) to run Apache and Microsoft Internet Information Services web servers and Nginx reverse proxy servers. Auto Scaling automatically scales up Amazon EC2 capacity to meet demand peaks and scales it back down during quieter periods. A MySQL open source database that hosts data related to players and gaming is running in Amazon Relational Database Service (Amazon RDS). Static data, including raw user data and system backup files, is stored and archived in Amazon Simple Storage Service (Amazon S3) and is made available for distribution over the Amazon CloudFront content delivery network to users in several countries. Amazon Route 53 provides domain name services that connect gamers to the relevant AWS infrastructure and manage traffic globally. Amazon ElastiCache enables Unalis to boost mobile game performance by making data available from in-memory caches rather than the database. By using Amazon Simple Email Service (Amazon SES) and Amazon Simple Notification Service (Amazon SNS), Unalis can send messages to gamers quickly and efficiently. The business also uses Amazon CloudWatch to monitor and manage its AWS environment, including delivering alerts if a problem occurs. In addition, Unalis takes advantage of Amazon DynamoDB to capture and store gaming data and make it available to its UniCloud platform. 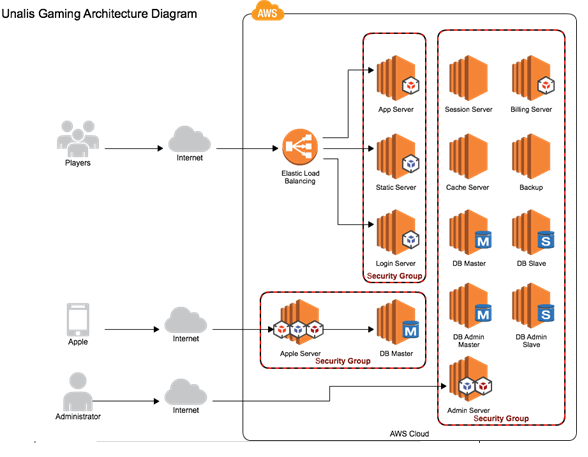 The entire AWS architecture operates in an Amazon Virtual Private Cloud (Amazon VPC) to secure sensitive data and systems from unauthorized intruders. 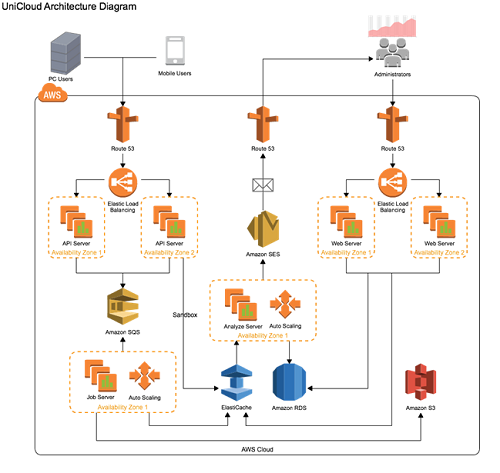 The figures below illustrate the UniCloud environment in AWS. Unalis has achieved a range of benefits from running its mobile games, analytics platform, and social media services in AWS. The company now delivers widely played mobile games—some with up to 100,000 users each—with full confidence that each person will enjoy a fast, responsive gaming experience. This confidence extends to peak periods when tens of thousands of gamers may be playing. Unalis has yet to experience an unplanned outage with AWS and network latency times are well within what the business views as acceptable limits. The business has also reaped considerable rewards from a faster time to market. By being able to spin up a new server with a couple of clicks rather than wait three months for a server ordered from overseas to arrive, Chou and his team can help the business release new games considerably faster than before. Finally, Unalis has been able to reliably capture and process gamers’ data for analysis by using the UniCloud platform, as well as provide developers with insights into user behavior that they can use to guide future projects. “By using our UniCloud analytics platform, developers can easily obtain and understand campaign tracking information such as number of clicks, downloads, and conversion rates, as well as consumption patterns, game analytics, and product data,” says Chou. To learn more about how AWS can help your game hosting needs, visit our game hosting details page.